chemical reaction by which oxygen combines chemically with the burning material. Such things as rags or paper soaked with oil or with paints or solvents are particularly subject to spontaneous combustion if they are stowed in confined spaces where the heat caused by oxidation cannot be dissipated rapidly enough. A fire involving combustible fuel or other material must have an ignition source, and the material must be hot enough to burn. The lowest temperature at which a flammable material gives off vapors that will burn when a flame or spark is applied is called the flash point. The fire point, which is usually a few degrees higher than the flash point, is the temperature at which the fuel will continue to burn after it has been ignited. 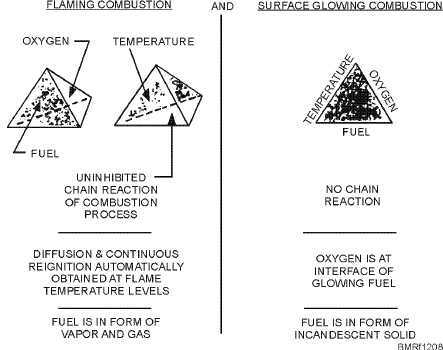 The ignition or self-ignition point is the lowest temperature to which a material must be heated to give off vapors that will burn without the aid of a spark or flame. In other words, the ignition point is the temperature at which spontaneous combustion occurs. The ignition point is usually at a much higher temperature than the fire point. METHODS OF HEAT TRANSFER Heat from a fire is transferred by one or more of the following methods: 1. Conduction 2. Convection 3. Radiation Conduction Conduction is the transfer of heat through a body or from one body to another by direct physical contact. For example, on a hot stove, heat is conducted through the pot to its contents. Wood is ordinarily a poor conductor of heat, but metals are good conductors. Since most ships are constructed of metal, heat transfer by conduction is a potential hazard. Fire can move from one fire zone to another, one deck to another, and one compartment to another by heat conduction. Often, the skillful application of water, using fog patterns to rapidly coat and recoat surfaces with a film of water, will slow or halt the transmission of heat by conduction. Fog patterns coat surfaces more efficiently 12-20 Student Notes: Figure 12-8.Tetrahedron and fire triangle.